Room block is available 24 – 30 March 2012. Extended stays from 22 March – 2 April are possible at the group rate based on availability at the time reservations are made. The Reservation Cut-off has passed, but the hotel is still booking rooms at the group rate on a space-available basis. 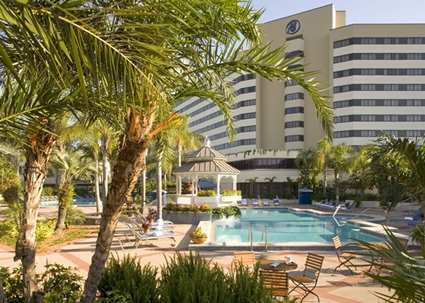 The IEEE Communications Society has a contractual obligation to fill a guaranteed block of rooms at the Hilton Orlando Lake Buena Vista. Significant financial penalties will be assessed should IEEE INFOCOM 2012 fall short of the expected number of guest rooms' attendee. By staying at the conference hotel, you will enjoy the convenience of residing at the conference venue and to a far greater extent provide valued assistance in support of IEEE ComSoc's financial obligations. Extra Magic Hours - Each day one of the Disney theme parks is open an hour early or stays open up to three extra hours in the evening.